Pamper your skin. Our citrus lavender hand wash is the perfect kitchen and bathroom companion. 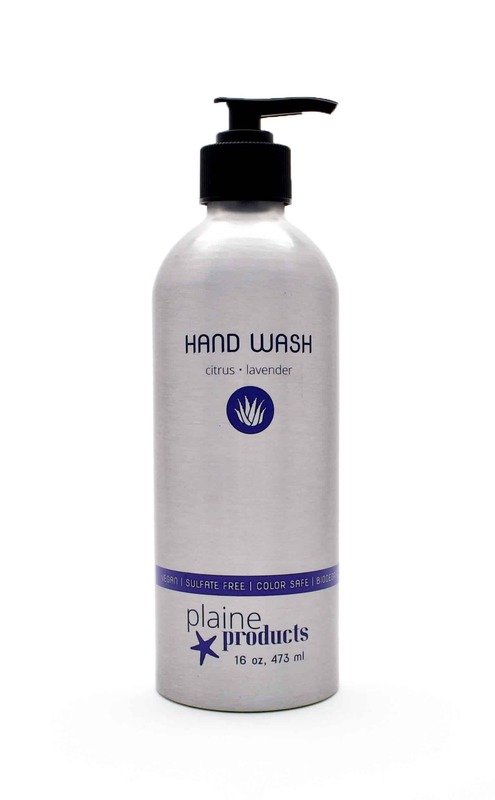 It gently washes away germs and bacteria without the use of harsh chemical detergents. Leave your skin fresh, clean and lightly scented with our essential oil blend of warm citrus and soothing lavender. 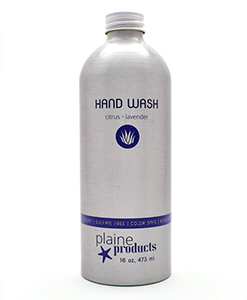 Includes 16 oz aluminum bottle of hand wash. At check out you’ll be asked how many pumps you need and whether you have empty bottles at home and need a return label. The best hand natural wash I’ve used. Living in NYC and living consciously, I’ve tried other brands in the hopes of finding the best product and packaging solutions. The aloe base doesn’t strip my skin like other natural products do. This winter my hands have thanked me for staying hydrated. Plus, I love the reusable packaging. Win all around. Smells Amazing! I love the overall look of the bottle it gives your bathroom a modern uniform look if you have all the Plaine Product line. I obviously love the thought of never having to buy another plastic soap dispenser again and not dealing with bar soap residue on the sink. However I’m not sure how sustainable $20 hand soap is for my wallet but for now I am satisfied. Love the hand wash. It smells so nice, is a great gift idea, and lasts for a long time considering the size. Well worth the cost! Love this product! First time buyer and didn’t want to buy a subscription without trying it first but my next order will definitely be it. Excellent hardware too so the pump will last! Awesome soap! Bravo!! I may not use mass production soap again. I have scent allergies but this scent was wonderful. This hand wash is excellent. I haven’t tried it in the kitchen with oil on my hands, but for general washing my hands feel incredibly clean without being dry. It doesn’t need to be shaken regularly, and just feels and smells great. 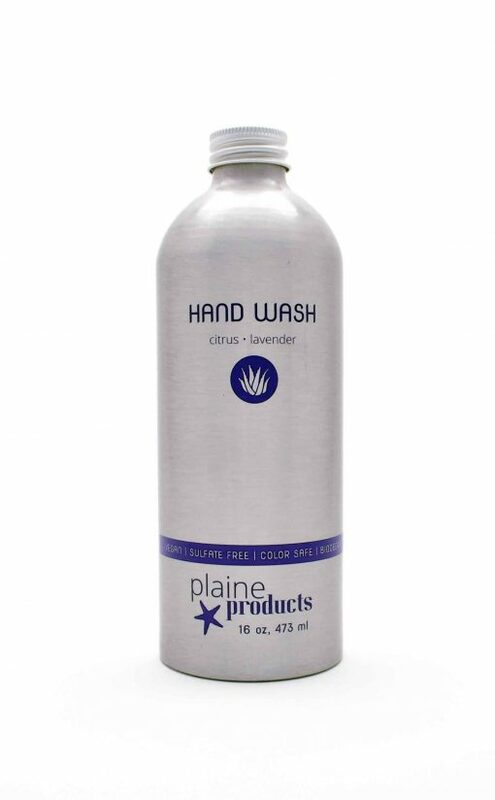 I’d never know this wasn’t a standard hand wash.
Love the concept, and I’ve really liked the hand wash so far. Hoping to switch a lot of my products over to Plaine. It’s a pretty big bottle too – i expect it to last a while but doesn’t take up a ton of space on the counter!